Traditional oven roasted whole turkey is the fail safe for most American homes when it comes to Thanksgiving (or any celebratory event that warrants roasting an entire turkey to feed a lot of people). There’s a reason for that and it’s because for the most part, oven roasting a turkey is a safe as well as relatively easy way to cook a turkey. Sure, people get fancy with how they prepare the turkey or techniques for making sure the white meat isn’t dry, but the gist is to put it in the oven and forget about it until it’s ready. Sometimes, however, it’s nice to shake things up with a completely different preparation such as deep frying a turkey or spatchocking a turkey (removing the back bone and flattening it while roasting). When I bought an electric smoker as a beginner (calm down die hard wood or coal smokers! ), I thought to myself that an electric smoker is really just an oven that imparts smoky flavor. 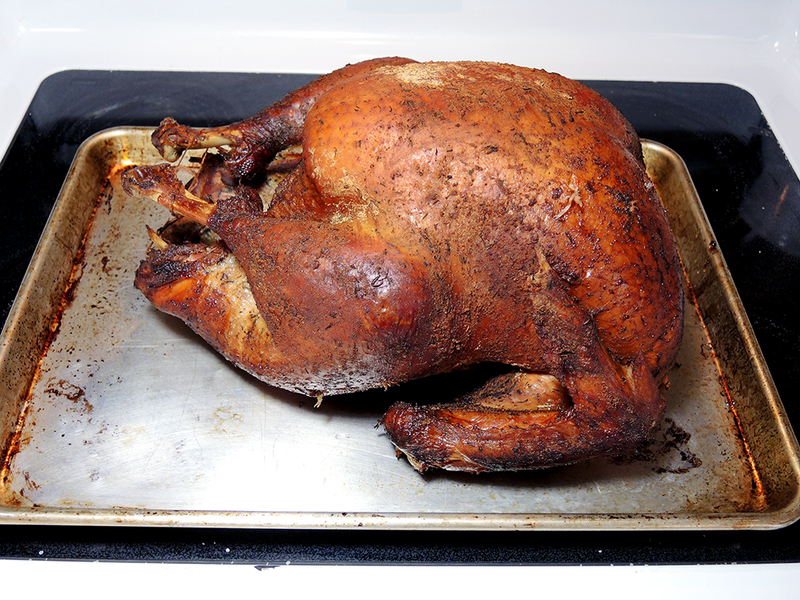 Why couldn’t I go ahead and roast an entire whole turkey in my smoker? Why should I keep waiting in the deli line with all of the other impatient, cranky people just to get my hands on some processed smoked turkey? Luckily, rather than ruin Thanksgiving for my family by experimenting with the only turkey, my day job abides by the old tradition of providing its employees with a free, farm fresh turkey each year around Thanksgiving. That meant I could take a chance on smoking a whole turkey without destroying the lovely holiday. 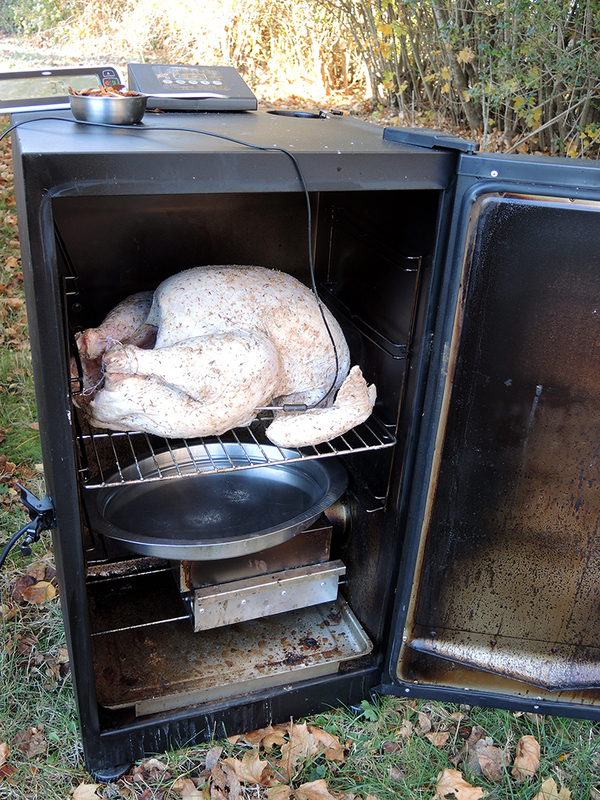 Before I did that though, I wanted to figure out how to keep the turkey from getting dry in the smoker. Smoke can easily dry out meat even with a water dish inside the smoker. I already knew about infusing moisture and flavor into poultry via brining in a salt water bath, but I didn’t have a large enough container or sturdy enough bag to hold the turkey and all of that liquid reliably. I discovered another process called, “Dry Brining.” It supposedly infuses flavor into the meat using only salt and spices without water. 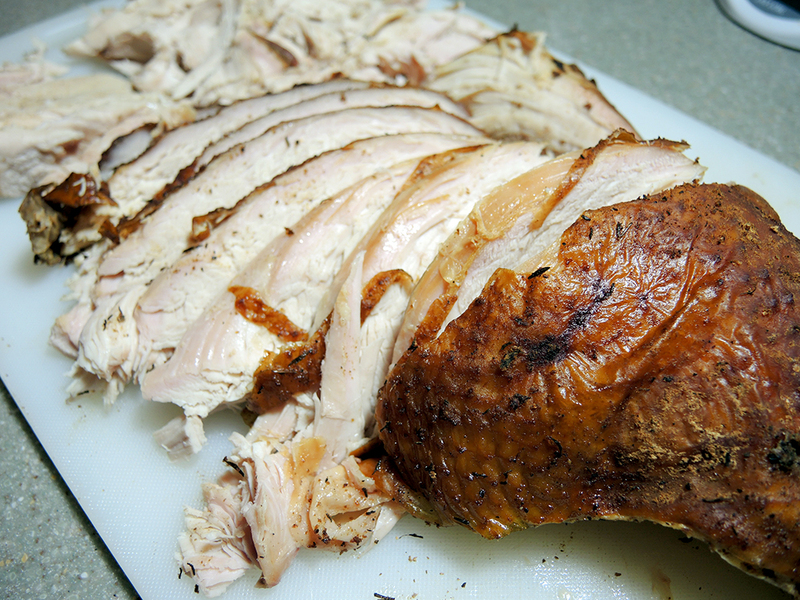 Rather than add moisture to the turkey, it helps to retain the moisture already in the meat. This seemed like a great idea because it didn’t involve precariously perching a large container filled with enough liquid to surround a turkey in my refrigerator. I also hoped that the dry brine would help to crisp up the skin. 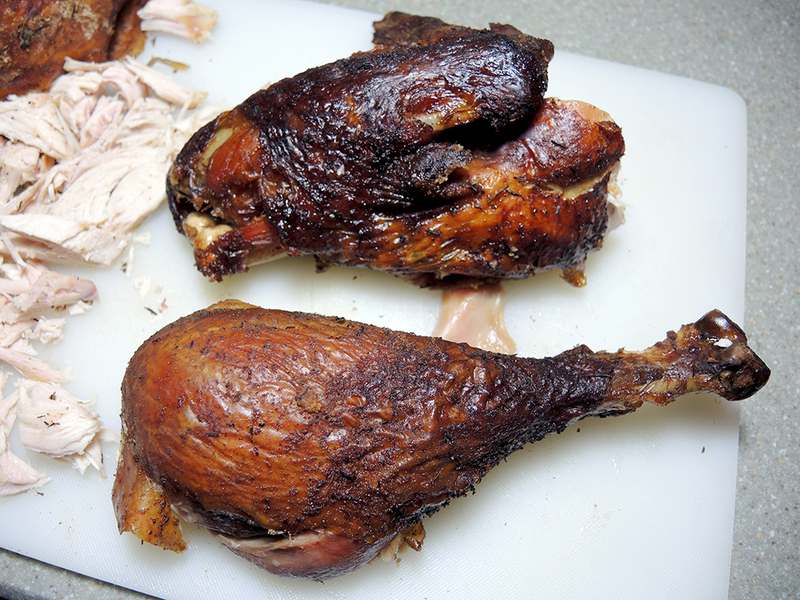 Smoked poultry is notorious for ending up with a rubbery skin that’s edible, but nowhere near as nice as crispy skin. After concluding the whole process, I ended up with a beautiful, deep brown turkey with a perfectly balanced smoke flavor. The meat itself retained a lot of moisture, although admittedly, the white meat was still a bit dryer than the dark meat. I would definitely make this recipe again for the holidays, especially if I didn’t have a way to wet brine the turkey. Whole smoked turkey in an electric smoker. If your turkey is in plastic, remove it from the packaging and make sure to remove the giblet bag (the sack filled with the organs and neck). You can save the neck if you want and smoke it as well or just use the giblets for other recipes. 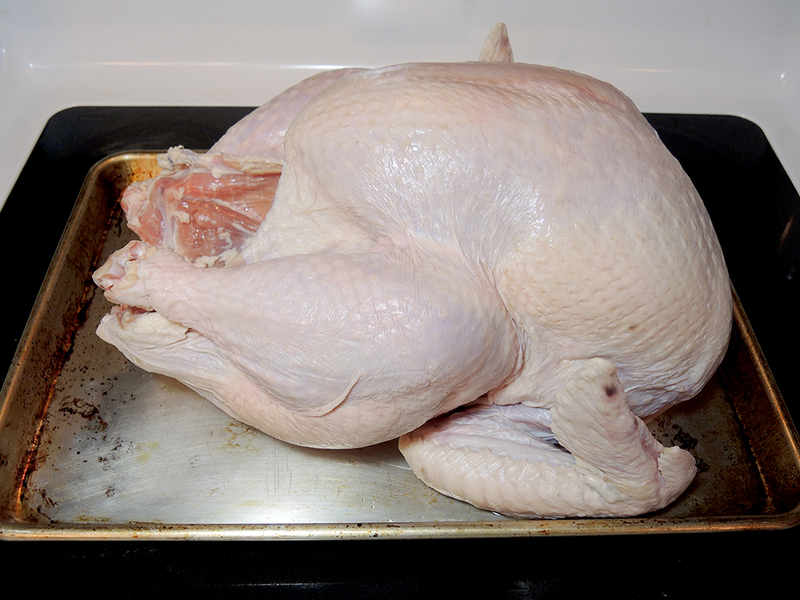 Place the turkey on a baking dish for easy transport and cleanup. 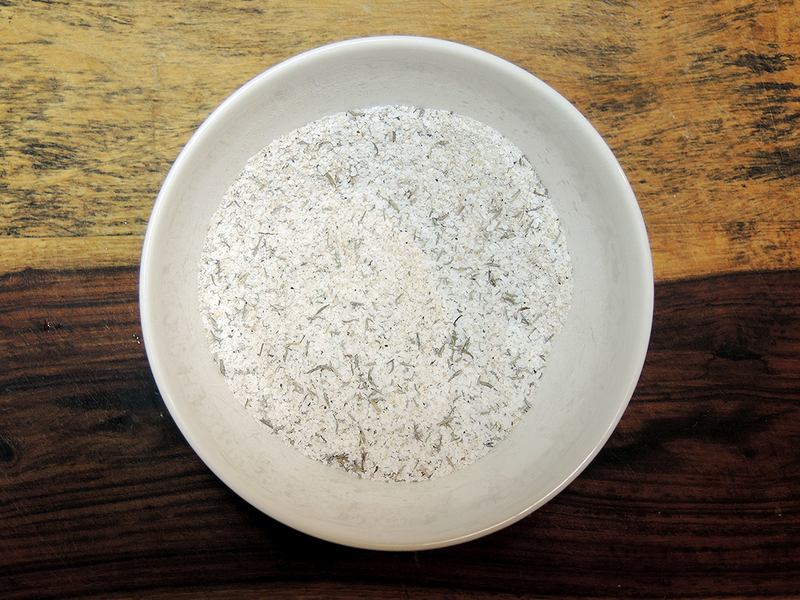 Prepare the dry brine ingredients by mixing all of the spices in a large bowl. 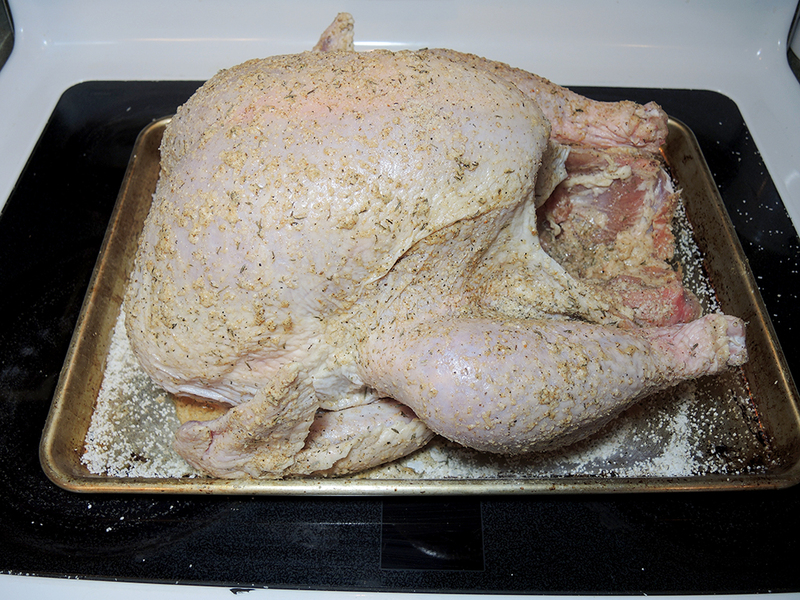 Spread 1/2 to 2/3 of the dry brine all over the turkey on the outside as well as inside the cavity. You don’t need to use all of the dry brine. Just make sure every surface is coated as well as the interior cavity. DO NOT put any brine under the skin between the skin and meat! Use latex gloves if you want or just wash your hands immediately after handling the dry brine and turkey so as not to dry out your hands or cross contaminate any surfaces. Tie off the legs of the turkey so that they aren’t splayed apart. This will help keep the shape of the turkey as it cooks. 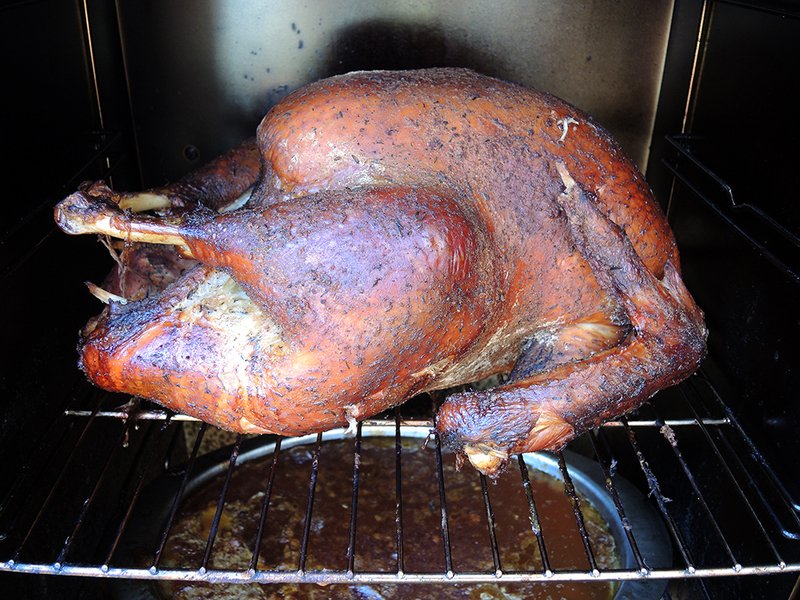 Place the dry-brined turkey in the fridge overnight or for about 8 to 12 hours uncovered until ready to smoke. When ready, heat the smoker to 250 degrees F and fill the water pan only about half way. The turkey will drip more fat and liquid into it, so you want to make sure it doesn’t overflow. As the smoker gets up to temp, soak the cherry wood chips in water. Once the smoker is up to temp, carefully place the turkey in the smoker and insert the meat thermometer deep into the thigh of the turkey for an accurate internal temp. Getting an accurate internal temperature is very important because if the interior of the turkey isn’t 175 degrees F in the thigh or 165 degrees F in the breast, it may not be safe to eat. Close the door of the smoker and add 1/2 cup of cherry wood chips to the smoker. Check the temperature of the turkey and add wood chips every hour. 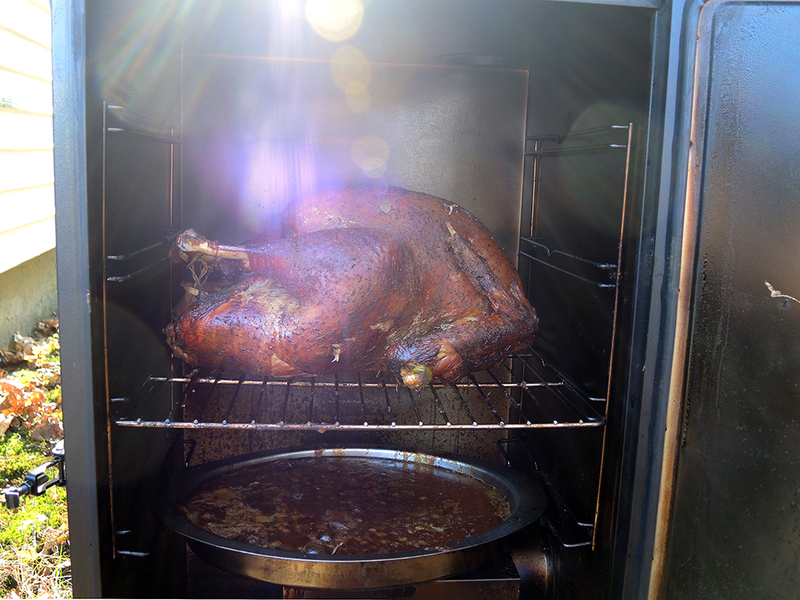 After 3.5 hours, check the temperature of the turkey every 20 minutes just to make sure it doesn’t get too hot. Depending on the size, the turkey should be ready in 4 to 5 hours. For 18 pounds, it took about 4.5 to 5 hours (approx. 15 min per pound). Once the internal temperature of the turkey reaches 175 or 180 degrees F in the thigh, open the smoker and behold its glory! Remove the turkey from the smoker and place back onto a baking sheet to cool down a bit and let the juices redistribute. When ready to serve, slice or carve the turkey as you normally would. Make note that the turkey leg is probably one of the best bites on this turkey! Can you use this brine but still roast in the oven? Hi Amanda. Yes you can! I’d also suggest melting some butter and rubbing it on the outside and between the skin and the meat just before roasting to get that nice crispy skin. Have a happy Thanksgiving! I made baby back ribs for the first time and follwed your recipe. They were amazing! Holy cow.. er.. turkey!! This was a wonderful brine recipe. I used the Penzey brand Chili 9000 for my chili powder and smoked paprika and it was great. 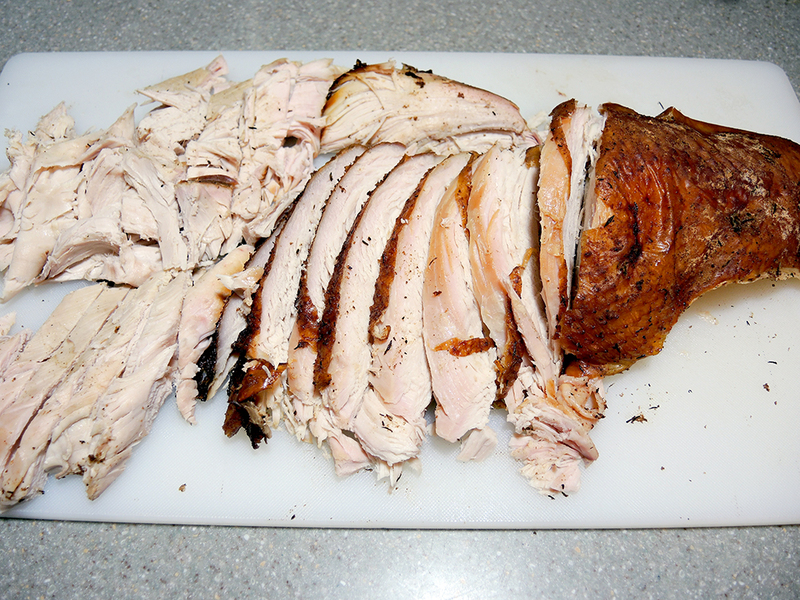 First time I’ve used baking powder in my turkey brine and it was a noticeable difference in the skin. Highly recommend and glad I found this site! Thanks so much for the kind words! I’m glad you enjoyed the recipe and that it worked out well for you! I’ll have to check out that brand of spices!